Investment banking provider LXM Group has relocated its UK headquarters from Belgravia to the redeveloped 48 Pall Mall offices, becoming the building’s first tenant. LXM has agreed a 10-year lease for the 3,835 sq ft sixth floor at a rent of £115/sq ft. The new 32,000 sq ft office building has been completely redeveloped behind a partly restored historic façade to provide nine floors of high specification office space that range from 2,000 sq ft to 4,000 sq ft with three roof terraces and cycle storage. LXM’s new HQ will serve as a central hub for its affiliates in New York and Athens and the firm’s chief executive Matthew Mavridoglou said the move strengthens their “commitment to sustained growth”. 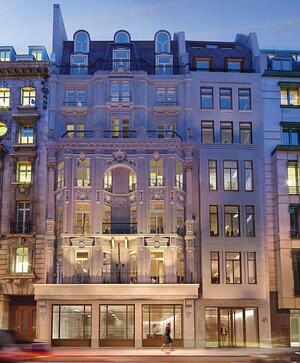 Savills and CBRE are 48 Pall Mall’s leasing agents. The Lorenz Consultancy acted for LXM.